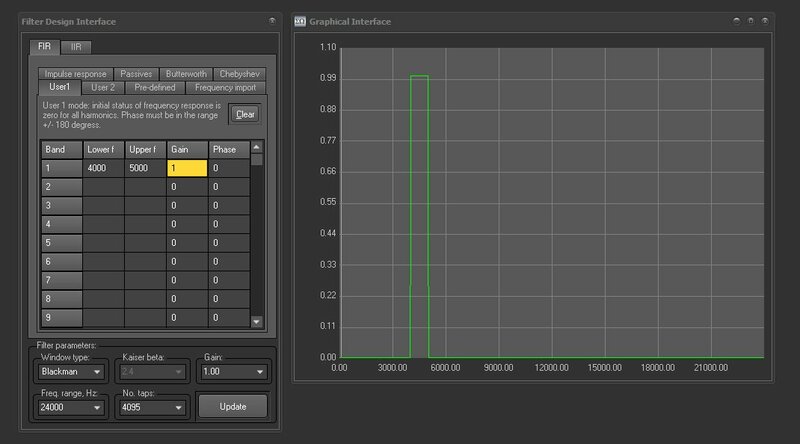 Signal Wizard 2.5 and 3.0 have a very powerful, intuitive and flexible filter design engine. The main tool for designing a filter starts with the Filter Design interface, shown on the left. The user can select either from a range of standard filter types or can design an entirely arbitrary response. Low pass, high bass, multiple band-stop, band-pass filters may be combined to produce very complex filters. Case 1: Ultra-sharp brick-wall filter. The trace on the left shows a seemingly random, noisy signal, but buried in this are two tones, closely spaced in frequency. Analysis shows that the noise starts at 3.2 kHz. Signal Wizard is used to design a low-pass FIR filter with a cut-off of 3.1 kHz and 2047 taps. The frequency response is shown in the central plot. Notice how the magnitude drops almost vertically from 0 dB to -60 dB. The filter is unconditionally stable and has pure linear phase. This kind of performance is almost impossible with analogue filters. The trace on the right shows the real-time result - the tone burst is recovered; a mix of two sinusoids at 2.85 kHz and 3 kHz. The reconstruction of the signal is near-perfect, with no discernible remaining noise. Case 2: Analogue system emulation. Signal Wizard can be configured to behave exactly as if it were an analogue circuit. In this example, Signal Wizard replicates the time domain behaviour of a 2nd order passive filter, based on an inductor, capacitor and resistor in series. The trace on the left shows the design, or simulated performance whilst the trace on the right shows the actual real-time response of the hardware. Case 3. Jamming noise cancellation from live audio. Here, Signal Wizard is used to remove strong narrowband noise from a single channel audio signal (a short piece of music). Click on the first play icon to hear the noisy signal. By performing a spectral analysis of the music, Signal Wizard can remove the noise using a very sharp notch filter. The example given here is actually performed in real time using the hardware.